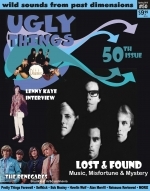 Find limited Ugly Things Magazine back issues. This category contains 34 products. 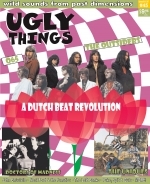 16-page program with blurbs about Love, Paul Revere & the Raiders, Glenn Campbell (Misunderstood), Unclaimed, Sloths and more. The Haunted, Milan (The Leather Boy), Spike-Drivers, Bees, Viletones, Others, Blue Aces, Cyril Jordan, more. LOVE: Johnny Echols interview; Group 1850, electric eels, Wimple Winch (Part 2), the Craig, Leopards, Syndicate, Wildwood, Illes, Cyril Jordan & more. Paul Revere & the Raiders: Mark Lindsay Interview, Brotherhood, Wimple Winch, Don Fardon and the Sorrows, Them (Billy Harrison Part 2), Vibrators, Creation of Sunlight, $27 Snap On Face & lots more. 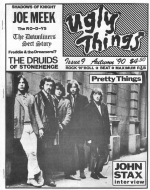 Masters Apprentices Story Part 1, the Fenmen, Sky Saxon, West Coast Consortium, Stepson, Imperial Dogs, Nico, Wildflower, more. The Move: Trevor Burton Interview; the Spades, Dave Clark Five, Hackamore Brick, Daughters of Eve, Dandy Girls, Troyka, more. Music Machine mega-feature, the Light, the Namelosers, Freedom's Children, Pat Kilroy & the New Age, Dirty Wurds and more. Inland Empire Special with the Bush and the Mustangs. Plus Phantom Brothers, Sheridan & Price, Flamin' Groovies, Rubber City Rebels, Willie Alexander & more. Misunderstood Story part 4, Belfast Gypsies, Mike & the Ravens, Mott's Men, Sheridan & Price, Ronnie Bird, Keith Relf interview & more. Misunderstood Story Part 3, Ace Kefford Interview, Chris Youlden, the Matadors, the Speakers, Wild Cherries and more. 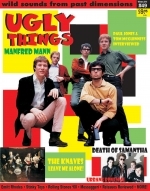 Manfred Mann, Death of Samantha, The Knaves, The Quick, Stinky Toys, Emitt Rhodes, Rolling Stones, more. 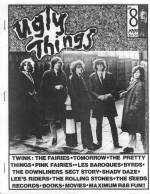 Fred Cole: Lollipop Shoppe/Weeds, the Betterdays, Stiv Bators, the Bougalieu and more. 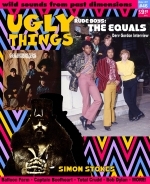 The Equals, Simon Stokes, the GoldeBriars, the Balloon Farm and more. 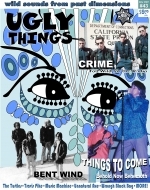 Things To Come, Crime, Bent Wind, the Turtles, Unnatural Axe, Music Machine and more. 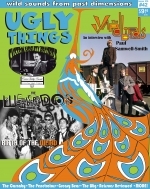 Yardbirds: Paul Samwell-Smith interview, The Weirdos, Custom Fidelity Records, The Penetrators, The Carnaby and more. 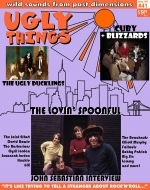 Lovin' Spoonful: John Sebastian interview, the Ugly Ducklings, the Joint Effort, Cuby + Blizzards, Elliott Murphy interview + more. 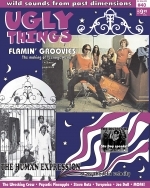 The Human Expression, the Flamin' Groovies, Dictatos: Stu Boy King Interview, Dave Hassinger & more. 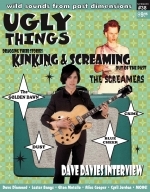 Dave Davies interview, The Screamers, Golden Dawn, Blue Cheer, Hazze Hep, Dust, Elton Motello, Dave Diamond, lots more.